Radical Together is written from the viewpoint of a mission minded family whom God called to pastor,much to their surprise, an old southern church who had turned inward rather than reaching out with the Gospel. Radical Together takes us on a journey that ultimately begs the question, "Are the good things we do in church in the name of God, our understanding of the Bible and who God is the very things that are keeping us from winning a lost world to Christ?" 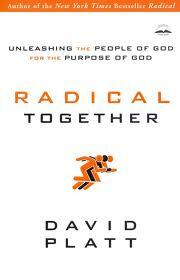 Radical Together challenges us to evaluate the good things we do in church to make sure they are the necessary things. It shows us our misunderstanding of the Gospel, when God is speaking, our task as believers, whom God exalts and dealing with the "wrong" people. Radical Together is written in sections. The first is the book content itself. Six chapters each dealing with how we do "church" in America today and how it can be different. In the back of the book you will find questions for small group discussion and after this section you will find David Platt's notes section in which he shows you all the resources he used in writing this book. I can't tell you how happy I was to read the notes section. Ninety five percent of the resources used in the making of this study are from the Bible itself. I almost jumped for joy. Here is an author who is challenging us to change the way we do church. He is challenging us to live differently. He actually used God's Word to show us how. What a concept! Bravo David! For me, this book was affirmation that I am not crazy nor am I alone. I have known that how we do "church" in America is not the best way to glorify God or reach the lost but didn't know how to change it. David Platt was able to put into words the hard questions that need to be asked if the church in America is going to be reformed. Don't forget to rank my review and be entered in a drawing to win a free copy of this book! FTC DISCLAIMER: “I received this book for free from WaterBrook Multnomah Publishing Group for this review”.